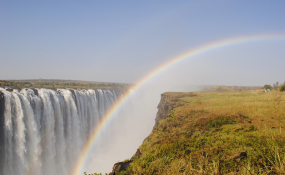 Chinese multinational group, Touch Road International Holdings, has revealed plans to construct two hotels in Harare and Victoria Falls. The group has partnered with the Zimbabwe Tourism Authority to grow Chinese tourist arrivals in the country as the tourism regulator is making strides to double arrivals this year going forward. As part of the deal, Touch Road has already guaranteed that the country will receive at least 350 tourists and investors monthly. Touch Road International Holdings Group Chairman Dr He Liehui, who was also appointed Zimbabwe's tourism ambassador to China, said while his organisation's efforts are centred on increasing the number of Chinese tourists to visit Zimbabwe, the group is also focused on building hotels in the country. Dr Liehui could not, however, divulge detail pertaining the size of investments that the firm will make towards the project arguing that the amount will be determined once negotiations with Government are complete. "We are in negotiations with the Government and we are discussing how to implement the project, the Ministry of Tourism and Hospitality Industry has already allowed us to scout for land, we are also in talks with Forestry Commission over the matter," Dr Liehui. According to the figures released by the Zimbabwe Tourism Authority in 2018 the country recorded about 2,7 million tourist arrivals surpassing the peak recorded in 1999. The 2018 arrivals were boosted by the bulk from the Chinese market. Over the years, the sector was affected by turbulent times that rocked the economy compounded by shortage of essential commodities, but the situation has since stabilised with availability of goods significantly improving. Tourism Business Council of Zimbabwe president Winnie Muchanyuka, hailed the development saying it was a solid initiative and a timely boost for the industry which is on the recovery path. "We are happy that this is an MOU that is coming to fruition, having something like this that has concrete plans and numbers of people coming is fascinating. "It is our hope that players across the tourism industry will benefit from the numbers that will be coming through because of this initiative," said Ms Muchanyuka.